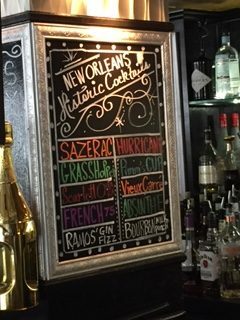 What do ten historic cocktails served in New Orleans have to do with tips & tools, you ask? Well, they’re the best kind of research out there. Live … up close … and personal. I should know because I tasted six of the ten. All in one afternoon. Who says research isn’t fun? I’m not ashamed to admit that Google! is one of my best friends when it comes to researching time periods, locations and how long it takes for a corpse to rot. [That’s no joke. My search history is pretty scary.] But after taking a trip to New Orleans this past week in order to perform research for my next gothic romance novel, I’m hooked on the idea of traveling to the destination of my story. Reading about something and experiencing it firsthand are two entirely different ball games. Smell. Sound. Taste. Touch. All of your senses are engaged when you’re researching firsthand. One of the coolest things I experienced while in New Orleans was a Creole bone reading conducted by the wisest psychic in the city. She’s practiced her craft for over 50 years. And she was wonderful to observe. The tone of her voice … or the way she paused between revelations … and her body language. All of it added to the atmosphere and isn’t something you can truly learn by reading an article on Google! Even the chalice she used to store her bones was fascinating. Her voice held a certain gravelly quality, and I loved the rings and bangles she wore. I’m talking about the mood she set. I was also shocked by the depth of the reading and the minute details she went into regarding what I can expect to happen over the course of the next year in my life. She spoke with confidence and never faltered in her advice. My heroine is a Creole and practices Voodoo. Most people are familiar with the idea of Voodoo dolls or gris-gris. Tarot cards are also well-known. But Creole bone reading? Aaahhh… good stuff. Local legends may only be local. I’m convinced that at least one quarter of what I learned cannot be found in books or on the internet. Some legends live in the people within the city and are shared by word of mouth, but never make it onto a written page. Or if you do find a morsel of information, it’s not enough to wet your appetite – but rather a trifling little bit of news. One thing I learned about the people of New Orleans is that they love to talk and entertain. I think it must be second nature. Bartenders. Hotel bellmen. Waiters. Store clerks. Everyone was friendly and loved to share stories and information. Simply interacting with the local folks offers wonderful fodder for shaping the personalities of the characters in our books. The little things we never read about. One night we were walking back from dinner at a restaurant on the outskirts of the French Quarter to our hotel on Bourbon Street at the corner of Orleans. It wasn’t late. Maybe 9:30 p.m. or so. But the streets were quiet. The stars were sparkling above us. Soft light glowed from the street lamps, illuminating the colorful buildings. And only a few people passed by … until two streets later where the crowd of people thickened and noise levels increased with street entertainers. Another street and it was full-fledged chaos. One street was highly focused on shopping – Royal Street. Whereas Bourbon Street was all about the bars and drinking. Jackson Square offered every possible form of entertainment. I’m not sure you really understand what makes a place tick unless you’re there and you walk the streets at various times of day and night. I could go on and on and on. After being submerged in the culture, I can’t help but believe my story will be so much richer for having been there. We can’t all afford to jet off to the wonderful settings of our stories every time. I get it. But try it once or twice and see for yourself if it makes a difference in your writing. Oh, and my favorite historic cocktail? Scarlet O’Hara: Southern Comfort, cranberry juice and a dash of lime. Yum.